Danny’s mother is white, and his father is Mexican. He goes to a fancy private school in San Diego, where he’s the only boy with brown skin. His passion is baseball; he’s got a killer arm, but didn’t make the school team because he can’t always control his pitch. When his mom and sister go to San Francisco for the summer to be with her new boyfriend, Danny decided to go stay with his cousins instead. He didn’t ever feel at home in San Diego, but he doesn’t speak Spanish and so he doesn’t feel like he fits in with the National City side of his family, either. However, he meets an unlikely ally-a boy named Uno, who starts off by beating him up over an accident. The two team up and become fast friends, working up a hustle based on Danny’s pitching. Together, they trick high school baseball players into betting that Danny can’t strike them out. See, they need the money: Uno’s trying to save up enough money to visit his father, and Danny’s doing the same thing. The one thing that Danny doesn’t know is that his father didn’t run off to Mexico; he’s actually in jail. When he finally learns it, it changes everything, and Danny has to work hard to figure out who he is and what he should do with his life. The summer passes in a mix of baseball, girls, family, and identity-formation. So, normally, I don’t like sports books. I just can’t get into them. I was doubtful for the first chapter of the book, but then I was completely hooked. It’s a great story. It’s a coming-of-age story, full of Danny’s problems with his identity and how he fits into the world, but it’s never sappy or trite. He has a very real, believable voice, and is surrounded by well-developed, realistic characters. It’s a fantastic story, and I totally get why YALSA picked it as a Best Book. There’s some rough stuff about self-injury (not terribly graphic) and issues with spousal abuse and some underage drinking, so this book is probably better for the 15 and up crowd. de la Pena, Matt. Mexican White Boy. Delacorte: New York, 2008. 252 pp. Ages 15 and up. ISBN 978-0385733106. If you liked this book, check out another book by de la Pena called Ball Don’t Lie or The Secret Story of Sonia Rodriguez by Alan Lawrence Sitomer. 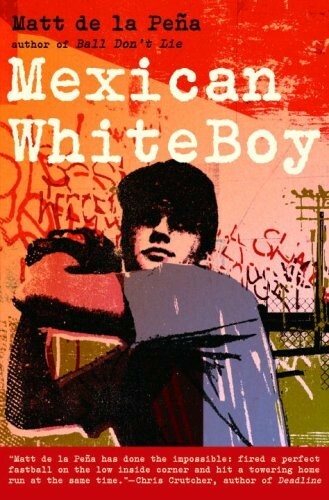 Posted on March 5, 2011 March 17, 2011 by ShannaPosted in ALA/YALSA Best Fiction for Young Adults, Award Winners, Fiction, Sports, YA LitTagged baseball, identity, issues, jail, self-injury, sports.